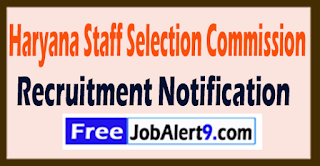 Haryana Staff Selection Commission (HSSC) Issued a Advertisement For Recruiting 302 Road Inspector, Telephone Operator, Patwari.All Eligible And Willing Candidates Can Check Detailed Advertisement From Their Official Website And Apply Online/ Before 21-08-2017.Eligible &Interested Candidates Can Check Detailed Information For Each Postion Such As - Eligibility Criteria, Qualifications, Age Limit, Selection Procedure Before Applying. 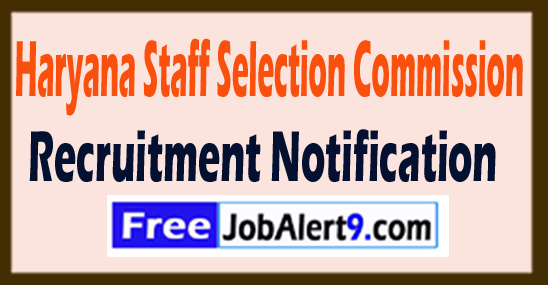 Haryana Staff Selection Commission (HSSC) Recruitment 2017. Age Limit :Candidates Minimum Age Limit 17 Years To Upper Age Limit 42 Years . INR Rs. 5200 - 20200/- With 1900/2400/- Grade Pay (Post 1,6,7,9-11,13-19,22,34), Rs. 9300 - 34800/- With 3600/4000/- Grade Pay (Post 2-5,8,12,20,21,23-31), Rs. 19900/- (Post 32). Educational Qualification : Candidates Must Pass 8th, 10th, 12th, Diploma, Graduation Degree, Master Degree or its Equivalent Qualification from a recognized Board / University. Candidates may fill the online Application through official website (http://www.hssc.gov.in). Before / (21-08-2017). Important Dates : Last Date for Registration of Online Application Form Is: 21-08-2017 . Click Here For HSSC Recruitment 2017 Detailed Advertisement.